Above: Queen Margaret of Anjou. On this day in history, 23 March 1430, Margaret of Anjou was born at Pont-a-Mousson in Lorraine to Rene of Anjou and his wife Isabella, duchess of Lorraine. Rene was titular king of Naples, Jerusalem, and Aragon, and duke of Anjou, Bar, Lorraine, count of Provence and count of Piedmont. Despite his claims to many kingdoms, Rene was unfavourably known as 'a man of many crowns but no kingdoms'. Margaret was the couple's fourth child and second daughter, and spent her childhood at the beautiful castle of Tarascon in southern France and in the old royal palace at Capua, near Naples. Contemporary observers described her in her youth as beautiful, dignified and graceful. 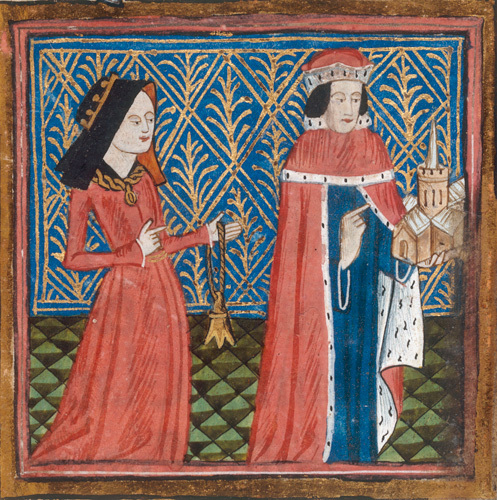 In April 1445, at the age of fifteen, Margaret married Henry VI of England and became England's queen. The marriage sought to achieve peace between the warring kingdoms of England and France, with the hope being to bring to a conclusion the brutal conflict known as the Hundred Years War. Although Margaret symbolised hopes of peace and prosperity, the marriage was not popular in England, for the bride brought no dowry, while the cessation of Anjou and Maine to Margaret's father and the king of France caused outrage and dismay. Margaret has traditionally been interpreted by historians as a cunning and avaricious meddler in politics, responsible for urging her husband to cede the kingdoms to the French, but Helen Maurer's careful research has called into question this view. Given that Margaret was only in her teenage years, in a strange land, when Anjou and Maine were ceded, it does seem unlikely that she was responsible for what took place. Margaret's position would have been secured early on had she given birth to a son with which to secure the succession, but this was only accomplished eight years after her marriage, when her son Edward was born in October 1453. 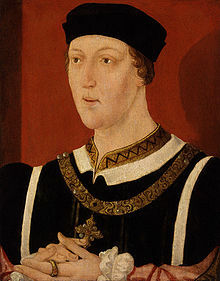 His birth could not have occurred at a worse time: several months earlier, Henry VI suffered a complete breakdown and was thought to have gone insane. He may have been suffering from a form of schizophrenia. Margaret's position became uncertain as the government fell into crisis. She did not become regent and, contrary to popular belief, did not espouse an aggressive stance towards the duke of York, who became Protector at this time. Indeed, she appears to have been content to cooperate with him and was on good terms with his wife, Cecily Neville. Margaret has tended to be characterised negatively as a vengeful, aggressive, merciless and cruel woman who was responsible for the outbreak of the Wars of the Roses by virtue of her partisan favour of the earl of Suffolk and the Duke of Somerset. She is often interpreted as the leader of a court party that was corrupt, decadent and wasteful, causing damage to the kingdom and tensions in society at large. This unfair portrayal of the queen has been encouraged by Shakespeare's portrayal of her as a she-wolf. The real Margaret of Anjou was almost certainly not the evil villain of legend. She was a pragmatic, intelligent and courageous woman who fought ardently to protect her son's inheritance and to safeguard her husband's position as king. It was hardly her fault that she was married to a weak and inept king unable to control factional discontent or rule with a steady hand. Margaret's attempt to provide strong governance caused anger and dismay, given that her role in English politics threatened to unsettle the established gender order. However, with the benefit of hindsight, we can appreciate the impossible situation Margaret found herself in, and admire her brave attempts to restore her deposed husband to the throne. She was not a she-wolf, but neither was she a saint. Rather, she is someone to be admired, respected and appreciated for her courage, pragmatism and devotion to her husband and son. Above: Humphrey, duke of Gloucester (left). Eleanor Cobham, duchess of Gloucester, is well-known today as a convicted sorceress. The second wife of Humphrey, duke of Gloucester, who was uncle to Henry VI, the duchess has usually been perceived as a proud and ambitious parvenu who resorted to witchcraft in a calculated attempt to ensure her husband's succession to the throne. At a time of dynastic uncertainty and political turmoil, the fear and dismay of her contemporaries is understandable. Believing that women resorted to the black arts as a mechanism for wielding power, they readily believed the charges against Eleanor. Their belief fitted in with the conventional understanding that women were naturally manipulative, power-hungry and secretive. Born around 1400, Eleanor was the fourth child of Sir Reginald Cobham and his wife Eleanor. Following her mother's death in 1422, she departed to serve in the household of Jacqueline, countess of Hainault. The countess was an immensely influential lady who was also duchess of Bavaria-Straubing, countess of Holland and Zealand, and had been Dauphine of France between 1415 and 1417 as the wife of the dauphin John. Eleanor's appointment to her household was therefore an excellent opportunity for her. She was not content merely to serve the duchess, however. In the spring of 1425 she became Humphrey's mistress. Three years later, Humphrey's marriage to Jacqueline was declared invalid, and shortly thereafter he married Eleanor Cobham. It is possible that Eleanor was an ambitious and calculating woman, but it is equally valid that she was in love with Humphrey and believed that she had a right to become his wife if he had, in fact, never lawfully been married to Jacqueline. Although the marriage may have attracted hostility, the couple appear to have been exceptionally happy with one another. They established a pleasure garden, La Plesaunce, at Greenwich and invited musicians, poets, scholars, physicians and their friends to form a miniature court there. 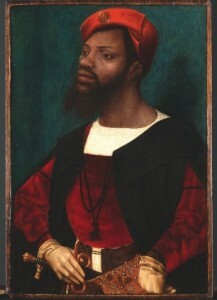 In 1435-6, Humphrey became heir apparent following the death of his elder brother, the duke of Bedford. This represented a turning point in Eleanor's career, for it enhanced her prominence greatly. If Henry VI, her nephew, died, she would become queen of England. Eleanor was accorded full recognition of her status: in November 1435 the duke created a jointure for her in his whole estate, and in spring of the following year she acquired the robes of a duchess for the Garter ceremony. She appears to have been close to her young nephew, the king. By 1440 she was consulting astrologers to cast Henry's horoscope and to predict her own fortunes. Given that the teenaged king had not yet married or produced an heir, Eleanor's actions may represent less a determined attempt to wrest the crown from him through witchcraft than an earnest effort to establish a sense of security regarding the succession. Her actions may be considered understandable in a context of dynastic uncertainty and international conflict, at a time of decline in England's fortunes in the Hundred Years War with France. Eleanor's actions were not necessarily suspicious in and of themselves; as Harriss notes, 'mathematical astrology had become socially and academically respectable and other great noblemen had astrologers in their employ'. Surely if the king harboured suspicions of his aunt's behaviour he would have acted sooner against her than he in fact did. The prediction of Eleanor's physician Thomas Southwell and principal of St Andrew's Hall, Oxford, Roger Bolingbroke, however, that Henry VI would be endangered by a serious illness in the summer of 1441, led to rumours surrounding the duchess's ambitions. Southwell, Bolingbroke and John Home, canon of Hereford, chaplain to the duchess, were all examined. They were arrested and charged with the practice of necromancy in July 1441 and, when Bolingbroke named Eleanor, she was examined for eighteen charges of treasonable necromancy, to which she admitted her guilt. She was incarcerated in Leeds Castle. Southwell died in the Tower, Bolingbroke was hanged, drawn and quartered and the 'Witch of Eye', Margery Jourdemayne, was burned, whom Eleanor had admitted to procuring potions from in order to conceive and bear Humphrey's child. The duchess herself was sentenced to walk barefoot to three London churches in penance on successive market days in November, bearing a taper. She was then imprisoned, firstly at Chester, then at Kenilworth, then on the Isle of Man, and finally at Beaumaris, where she died in 1452. It is uncertain whether Eleanor Cobham was guilty of the charges levied against her. There is no evidence that she plotted the king's death, although she did admit to consulting his horoscope and to obtaining potions from a witch with which to fall pregnant by the duke. Undoubtedly the charges were politicised and sought to attack her husband. High status women were vulnerable to charges of witchcraft and treasonable activity as a way of casting suspicion on their husbands. Jacquetta, duchess of Bedford, was another victim of witchcraft accusations in the reign of Edward IV that were motivated by a desire to bring down the Wydevilles. Humphrey's political enemies used the charges as a way of estranging the duke from his nephew. Six years later, the duke himself was arrested and died in suspicious circumstances. Eleanor, duchess of Gloucester, may have been less a convicted sorceress than a victim of the dynastic turmoil, political conflict and gendered suspicions of the mid-fifteenth-century.